Dr Ross Maxwell is Chair of Rural Health Workforce Australia. He is a procedural GP in Dalby, Queensland, and a former President of the Rural Doctors Association of Australia. You can’t have healthy communities without a skilled health workforce. So what is the current state of the health workforce in rural and remote Australia? Often when people ask this question they are really saying: ‘are there enough doctors in the bush?’ This ignores the fact that the health workforce comprises a wide range of professionals. These include medical doctors (GPs and other specialists), nurses and midwives, dentists and a variety of allied health professionals such as psychologists, physiotherapists and pharmacists. In addition, there is a very large workforce of aged care workers, counsellors, aids and carers. So there is no short or simple answer to that initial question. Overall however, it’s no secret that in general Australia’s health workforce is maldistributed, with most professionals concentrated in major urban areas and decreasing the further one moves away from the cities. This is by no means a phenomenon unique to Australia, nor indeed unique to the health workforce. Drawing population data from the Australian Bureau of Statistics and health workforce numbers from the Department of Health’s National Health Workforce Dataset, the table below shows the number of professionals per 100,000 population for six selected health professions. In terms of broad distribution by Remoteness Area, GPs and nurses and midwives are reasonably well distributed. The other professionals shown are maldistributed – that is the number of professionals drops sharply with increasing remoteness. Like most things in life, the story is never that straightforward. While the past decade or so has witnessed significant improvement in the distribution of GPs, this does not necessarily equate to a commensurate increase in access or service provision. Differing working hours, skill-sets and service models must also be considered. For example, GPs in rural and remote towns often provide many additional services to their communities as compared with urban GPs such as on-call, hospital emergency and ward rounds and attending accidents – this can mean less time available for patient consultations compared with an urban GP. 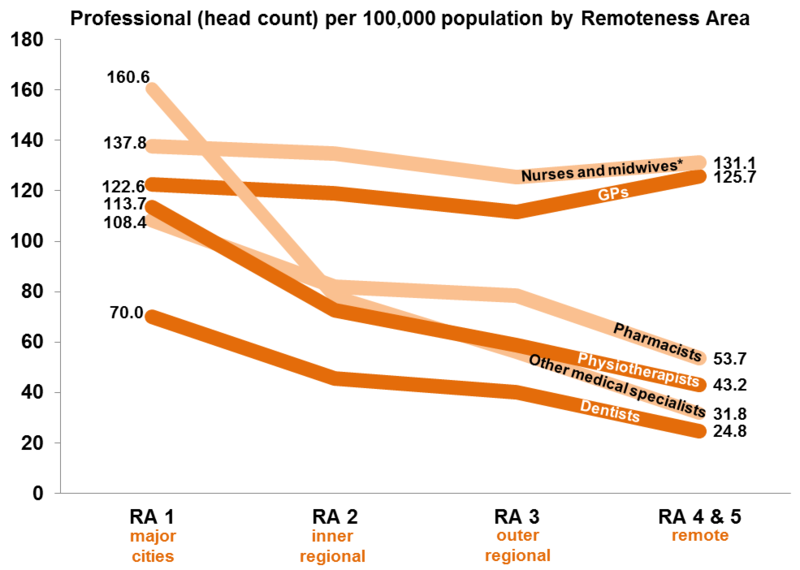 The Grattan Institute reports that during 2010-11, the number of GP services provided per person in very remote areas was about half that of major cities4. Furthermore, people in rural and remote areas tend to have relatively higher levels of chronic disease and poorer social determinants of health indicators and therefore may require higher levels of health services. The Australian Institute of Health and Welfare’s latest report card on the health of Australians and our health system cites levels of deafness, blindness, diabetes and cardiovascular disease that are significantly higher outside of major cities5. Finally, geographic classifications such as ASGC-Remoteness Area (or even the more finely tuned Modified Monash Model) provide a very broad view and can mask significant individual community variances. For example, within the category of Remoteness Area 3 (outer regional) there will be many communities performing very well on a range of health status measures, including access to health workforce, and others doing poorly. Which brings me to what I believe is a more important question than ‘what is the current state of the health workforce in rural and remote Australia?’ And that is ‘why are we doing this?’ Why do we care about the current state of the health workforce in rural and remote Australia? The answer is of course that we are trying to improve health outcomes and build healthier communities. While workforce is crucial to this poorer access to quality healthcare providers has been cited as one of the primary causes of health inequity and poorer health outcomes – there are other pieces to the puzzle. As a society, we need to delve deeper. What is the point of treating people and then sending them back to the conditions that made them sick in the first place? So we need to look at things like water quality, food security and poverty. We were reminded of this so eloquently by Sir Michael Marmot during his recent visit to Australia to present the 2016 Boyer Lectures. It’s clear that improving rural health outcomes is more than a numbers game and as a sector we need to move beyond ‘counting heads’ and look at the improvements being made in the health of our rural communities. A key part of this will involve greater community engagement and working with a broader range of stakeholders than we are used to. The healthcare sector is currently undergoing a period of unprecedented reform (think Federation White Paper, NDIS, MBS Review, Primary Health Care Advisory Group, etc). These reviews have at their core redesigning service models to deliver more efficient and cost-effective care through introducing market-based approaches, fostering competition and increasing consumer choice. More and more it is being recognised that the consumer must be at the centre of our planning and thinking. This involves much more than having a consumer representative on a planning committee or surveying clients about their satisfaction levels with a health service. We need to embrace the concept of co-creation (or co-design) and include consumers in the initial planning and assessment phases of health service design and delivery, and continue this engagement every step of the way. Such approaches have already been adopted by some health services and Primary Health Networks. Rather than ask what is the status of the rural and remote health workforce, we must ask what is the status of our rural and remote communities? That has to be the starting point for creating a healthier, fairer Australia. 2 Australian Bureau of Statistics 2016. Regional population growth, Australia, 2014-15. Cat. No. 3218.0., Canberra: ABS. 4 Duckett S, Breadon P & Ginnivan L 2013. Access all areas: new solutions for GP shortages in rural Australia. Melbourne: Grattan Institute. 5 Australian Institute of Health and Welfare 2016. Australia’s Health 2016. Australia’s health series no. 15. Cat. no. AUS 199. Canberra: AIHW.